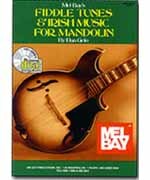 A fun-to-play collection of 62 favorite fiddle and Irish tunes arranged in notation and tablature for mandolin solo. Ideal music for intermediate level technical study in sight reading. The CD is in split-track format, thus allowing the mandolin student to play along with the mandolin solo, lively guitar accompaniment, or both. Due to time constraints, the CD contains only 18 songs from the book.